Travi-Anti-Sect is made from biodegradable substances and is odorless, non-irritating and does not have influence on your pigeons' resistance. For the control of insects such as mites, lice, cockroaches, wasps, ants, moths, ticks, fleas etc. Insecticide spray. For the elimination of insects. For the elimination of insects such as mites, lice, cockroaches, wasps, ants, moths, ticks, fleas, etc. For topical application to the fur or feathers. Shake well before use. Dosage : 1Ð 2 times spraying. 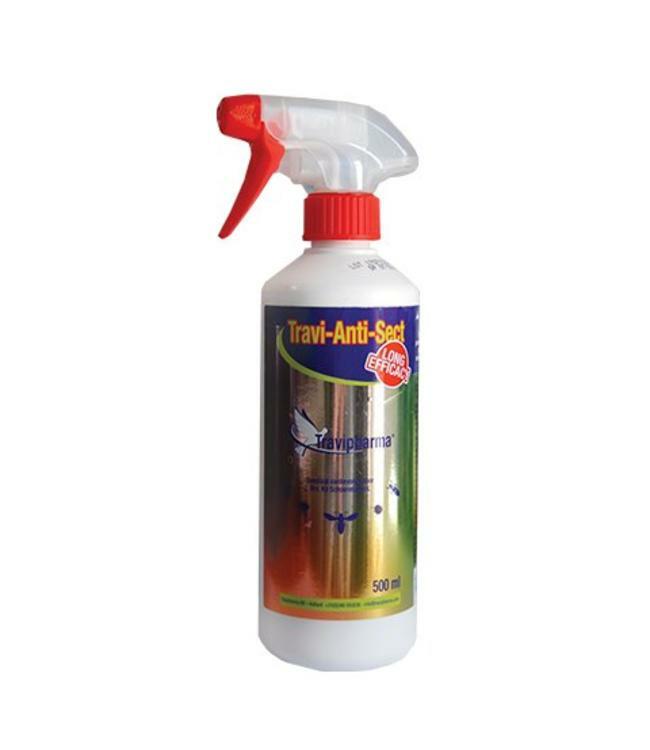 Spray Travi Anti Sect on the animal from a distance of 15 cm, while protecting the eyes en nose. Let dry and do not rinse. On pigeons and poultry: 1 times spraying under the wings and back. Spray the environment of the animal, such as the berth, transport equipment, perches and passageways where insects enter (windows, chinks, seams, doors, etc.) to avoid contamination. The treatment can be repeated after 6 weeks if necessary. The spray does not harm the quality of the fur nor feathers. Pigeons (>5 week old youth and adults).